Before there was Iron Man, Guardians of the Galaxy, or Marvel's The Avengers, Marvel's main big screen presence was a vampire hunter by the name of Blade. The hero first debuted in the 70s, but arguably was at his most popular when Wesley Snipes brought life to the character in the late 90s. 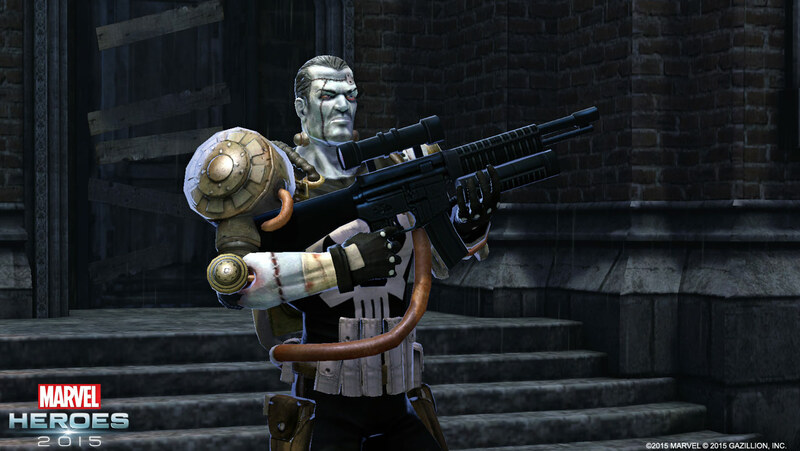 Now he has arrived in Marvel Heroes 2015 and he's ready to start taking it to the undead for Halloween. Blade's abilities are unique in that they take advantage of the Daywalker's human and vampire sides, but they also have a notable drawback. He'll often go into Bloodlust, which can only be controlled by injecting himself with an active ability called Serum. Injecting himself with the Serum will recover health and keep Blade in control, but if his bloodlust goes out of control, Blade will rapidly lose health until he's left with only 1 HP. Character builds will be especially important with this hero. While Blade will be available all year, there are a few additions that are more "limited time" in scope. Mystic Mayhem returns, offering a 31 percent server-side boost to everything for today only, as well as trick-or-treat powerups, pumpkin and candy credit item drops, and Halloween Mystery Bags. During this event, the Demon Lord N'astirh seeks to bridge together the realms of Earth and Limbo, bringing its enemies onto the earthly plane. Players can attempt to stop his machinations by jumping into the Infernal Limbo Zone, as part of a new mission. Players can also find a new limited-time Wolverine Symbiote costume, in which Logan is possessed by the Venom symbiote, and a new Team-Up character: Franken-Castle. Yes, Gazillion is well-aware of one of the sillier moments of the Punisher's history (and that's saying a lot) in which Frank Castle was maimed and dismembered by Wolverine's evil son and then pieced back together into a Frankenstein monster. This story happened, people! He did eventually get better. The Halloween event will be active for a little while longer, but once it ends, be on the lookout for another big addition set to hit Marvel Heroes 2015: The Danger Room.